Hydrocarbons (oil and gas), salt, gypsum, building stone, aggregate, and ground water are the main economic products associated with Permian deposits in Kansas. 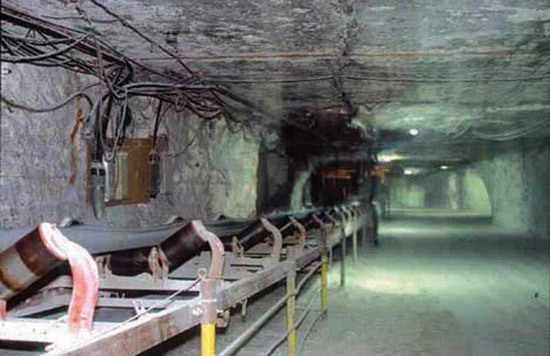 Underground salt mines (Hutchinson Salt Member) have been utilized for large underground storage areas that provide conditions of relatively constant temperature and humidity. Although salt is an abundant important natural resource, the Permian red-bed sequence in Kansas has been a source of gypsum, paint pigment, building stone, construction aggregate, and clay for bricks (Swineford, 1955, p. 166). Hydrocarbon production, particularly natural gas, has been important in Kansas since the 1930s (Carr and Sawin, 1997, p. 1). Within the Hugoton embayment in southwestern Kansas, the largest areas of natural gas production are the Panoma field in the Council Grove Group and the Hugoton field in the Chase Group (Carr and Sawin, 1997). Minor gas production from the Chase Group occurs in central Kansas over structurally controlled oil fields whose main production is from deeper reservoirs. The decline in reserves and production of natural gas in carbonate and siliciclastic reservoirs of the Chase and Council Grove Groups in the giant Hugoton and Panoma fields has led to renewed efforts to characterize these reservoirs by petroleum geologists. Over 27 trillion cubic feet (TCF) of gas has been produced from these fields covering over 4,100 mi2 (10,620 km2) and containing nearly 8,000 producing wells in Kansas. These fields comprise the largest gas area in the western hemisphere. Gas accumulated in a giant structural-stratigraphic trap as porous and permeable carbonate reservoirs grade updip to nonpermeable fine-grained siliciclastics. Anhydrite beds of the overlying Sumner Group form effective seals that trap the gas. The original pore volume of gas in place in the Hugoton field alone is estimated at 34.5 to 37.8 TCF (Olson et al., 1997). Thus, an estimated 10 TCF of natural gas is available as a target for improved recovery technologies. Regional correlation of Chase and Council Grove strata from the outcrop to the subsurface using both cores and wireline logs enhances the application of formal stratigraphic classification and nomenclature to the petroleum reservoirs. Using this stratigraphic information, a sedimentologic and petrophysical framework aids in the construction of quantitative three-dimensional diagrams of reservoirs in these gas fields. Mapping of genetic units and lithofacies in conjunction with structure indicates a distinct association with the regional shelf-to-basin configuration of the shelf, modified by local changes in inferred paleotopography. Thus, shelf elevation and sediment accommodation space created by eustasy exerted significant controls on the details of the reservoir architecture. Significant salt accumulations occur at three positions in the Permian of Kansas; these are, from the oldest to youngest: 1) Hutchinson Salt Member in the Wellington Formation (Watney et al., 1988), 2) Ninnescah Formation, and 3) in the Blaine Formation and Flower-pot Shale (Sawin and Buchanan, 2002). Sawin and Buchanan (2002, p. 2, fig. 3) illustrated the areal extent of these three natural occurrences of salt in Kansas. Salt has been mined from the Hutchinson Salt Member of the Wellington Formation in central Kansas since the late 1800s for use as a food preservative, rock salt for livestock and ice melting, table salt, and industrial applications (fig. 72). Both room-and-pillar and solution salt mining in Kansas are accomplished at relatively shallow depths (under 1,000 ft [305 m]) in proximity to the Hutchinson Salt Member subcrop, thus the mine locations in central Kansas (Sawin and Buchanan, 2002). Large open rooms left after salt removal by room-and-pillar techniques (fig. 73) are used for underground storage of vital records and documents in one of the Hutchinson mines. Salt removed by solution methods creates cavities or vugs. Some of these vugs are created solely for storage of liquefied petroleum (LPG) and natural gas. Today's solution mining leaves at least 50 ft (15 m) of halite above the solution cavity to ensure that the sealing and plastic behavior of the halite envelops the cavities. 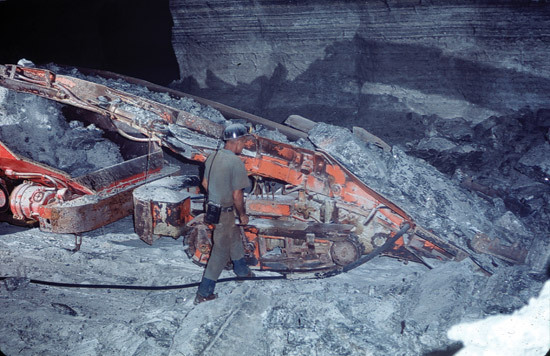 Figure 72--Underground mining of Permian salt in Reno County, Kansas; from photo files of the Kansas Geological Survey. Figure 73--Room-and-pillar mining of salt at Hutchinson, Kansas; from Sawin and Buchanan (2002, p. 3, fig. 5). The total underground-gas-storage capacity in Kansas amounts to over 302 billion cubic feet (BCF) with less than 1% of this storage in salt caverns (Energy Information Administration, 2005). The combined gas storage and pipeline capacity in central Kansas has resulted in this area becoming one of several large national hubs for natural gas transmission. The Hutchinson Salt Member was considered for possible underground storage of nuclear-waste products near Lyons, Kansas, in the early 1970s. However, concerns for unaccounted, abandoned, and unplugged oil and gas wells that penetrated the salt precluded implementation of the nuclear-waste storage (Angino and Hambleton, 1971; Walker, 2006-07). Abandoned, unplugged wells in the Hutchinson Salt Member also factored into the catastrophic gas escape and explosions at Hutchinson, Kansas, in January 2001. An additional hazard can occur when the salt beds are near the present-day land surface where it is easily dissolved by ground water. The dissolution of the salt creates cavities, sometimes quite large, that can result in the collapse of the rock layers overlying the salt. Such collapse produces surface depressions called sinkholes (Sawin and Buchanan, 2002, p. 5, fig. 6). Gypsum and anhydrite, both calcium sulfate minerals, commonly occur in the Permian rocks of Kansas (figs. 74, 75) and are often associated with beds of salt. All three of these minerals are precipitated from seawater with salt being precipitated after the calcium sulfate minerals. Although gypsum and anhydrite are common in the Permian rocks of Kansas, there are only three areas (all different rock layers) where the occurrence of gypsum is economical. These are, from oldest to youngest, 1) Easly Creek Shale in Marshall and eastern Washington counties; 2) Wellington Formation in Dickinson, Saline, and Marion counties; and 3) Blaine Formation in Comanche and Barber counties (Jewett, 1942; Kulstad et al., 1956). Gypsum mining was well established in Marshall County by 1872 (Jewett, 1942), and high-quality gypsum is still mined from a 1.5-1.8-m (5-6-ft)-thick bed at the base of the Easly Creek Shale near Blue Rapids, Kansas. 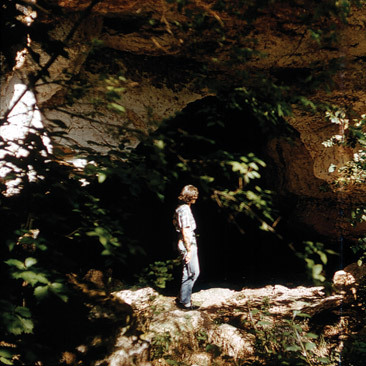 Figure 74--Natural bridge (now collapsed) in Barber County, Kansas, created by the solution of soluble minerals, halite and gypsum; from photo files of the Kansas Geological Survey. 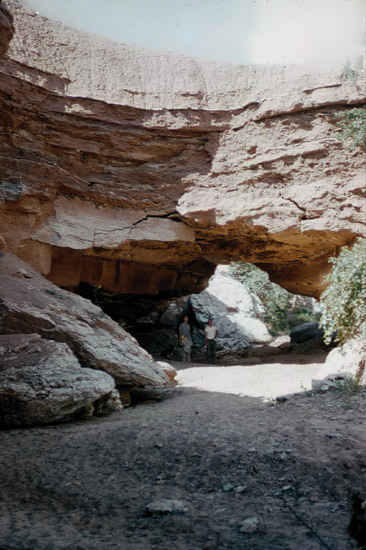 Figure 75--Entrance to Big Gyp Cave in the Blaine Formation in the Red Hills of Comanche County, Kansas; from photo files of the Kansas Geological Survey. A number of gypsum mines operated in the Wellington Formation in central Kansas between the late 1880s into the 1940s (Kulstad et al., 1956). The mine at Gypsum City in Saline County was awarded a medal for the quality of the plaster it provided for the buildings at the 1893 Chicago World's Fair (Kulstad et al., 1956, p. 55). The "Red Hills" (Jewett, 1942, p. 140), also known as the "Gypsum Hills" (Kulstad et al., 1956, p. 24), in south-central Kansas are so named because this is the general outcrop area of gypsum in the Blaine Formation. Mining of gypsum began near Medicine Lodge, Kansas, in the 1880s. Today, gypsum from a mine and quarry at Sun City is converted to a stucco (referred to as plaster of Paris) that is used in the manufacture of gypsum wallboard (Sawin et al., 2002). Although gypsum is a useful natural resource (Kulstad et al., 1956), it along with anhydrite can, because of their solubility, be a hazard to near-surface structures. Solution of these soluble calcium sulfate minerals can result in surface depressions (fig. 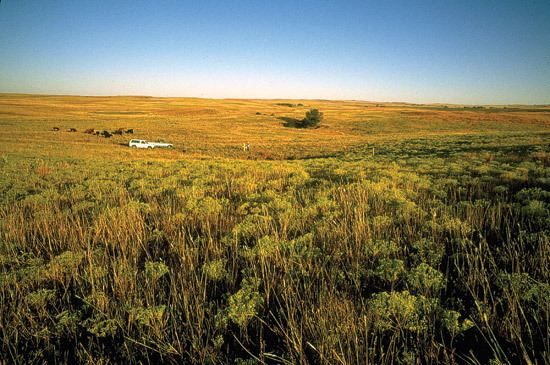 76) such as the Big Basin in Clark County, Kansas. In such areas the ground surface can be unstable and still subsiding. Figure 76--Sinkhole in a pasture in Clark County, Kansas; from photo files of the Kansas Geological Survey. Building stone and aggregates are quarried from the limestone beds of Wolfcampian age along the eastern edge of the Permian outcrop. Stone from most of these limestone beds has been used at one time or another for buildings, especially locally by early settlers where trees were scarce or absent (Risser, 1960). The most commonly used Permian limestones for public and residential buildings are the Neva, Cottonwood, Funston, Fort Riley, and Cresswell (Risser, 1960; Grisafe, 1976; Aber and Grisafe, 1982). 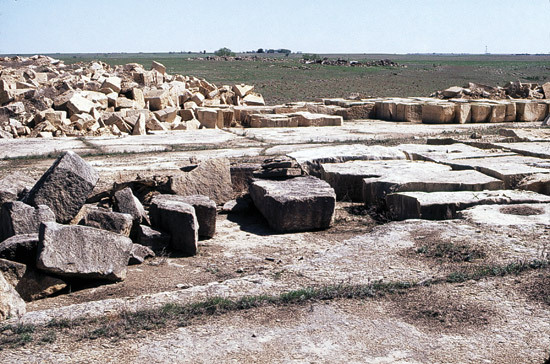 Although soft, vuggy limestone (parts of the Neva) and hard limestone containing chert (Threemile, Schroyer, Florence, and parts of the Cottonwood and Cresswell) are not suitable building stone, these limestones are crushed and used for aggregate (Risser, 1960). Two of the best-known building stones in Kansas are the Cottonwood (fig. 77) and Fort Riley (fig. 78); at one time the Cottonwood was the most important source of building stone in the state (Risser, 1960, p. 106). The Cottonwood was extensively quarried in Chase County (fig. 79) and was used in the construction of the Chase County Courthouse. Near Silverdale, Kansas, in Cowley County, the Fort Riley has produced what is called the "Silverdale" (fig. 80), and in Geary County limestone from the Fort Riley is known as the "Junction City" (fig. 81; Risser, 1960). Original buildings on the Fort Riley Military Reservation were constructed using "Junction City" stone. Figure 77--Roadcut exposure of Cottonwood Limestone Member of Beattie Limestone along northwest side of K-13, just south of center, sec. 18, T. 9 S., R. 8 E., Pottawatomie County, Kansas. 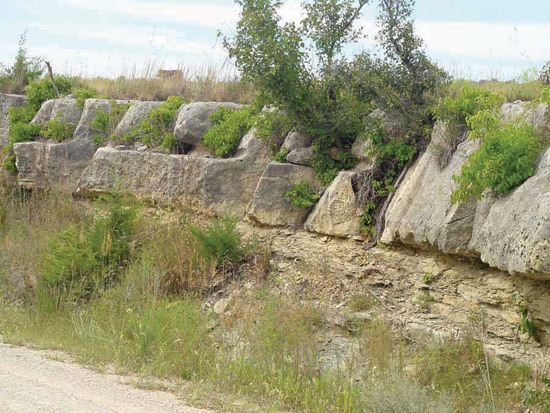 Figure 78--Exposure of lower beds and "rimrock" of the Fort Riley Limestone Member of the Barneston Limestone; near center of east line NE sec. 30, T. 12 S., R. 6 E., Geary County, Kansas. 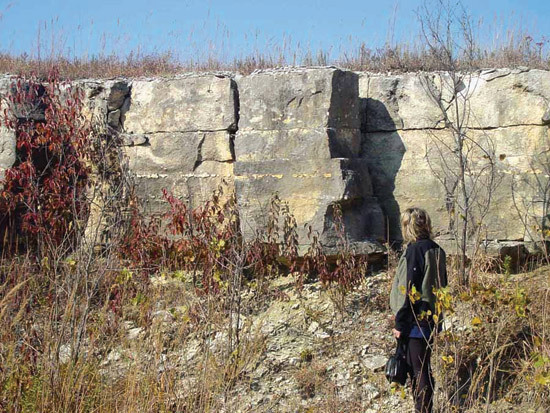 Figure 79--Bayer Stone Company quarry in the Cottonwood Limestone Member of the Beattie Limestone; NW sec. 36, T. 19 S., R. 8 E., Chase County, Kansas; courtesy of R. S. Sawin. 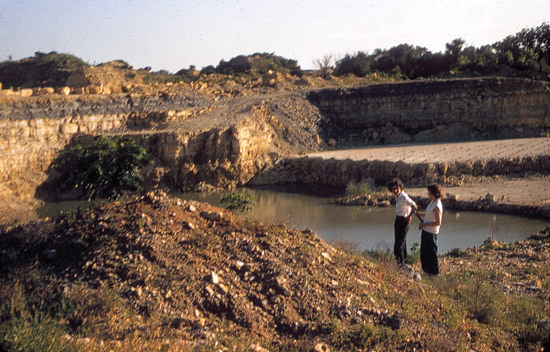 Figure 80--Quarry in the "Silverdale" Fort Riley Limestone Member of the Barneston Limestone near Silverdale in Cowley County, Kansas; from photo files of the Kansas Geological Survey. Figure 81--Quarry in the "Junction City" Fort Riley Limestone Member of the Barneston Limestone near Junction City in Geary County, Kansas; from photo files of the Kansas Geological Survey. Grisafe (1997, p. 1, fig. 1) showed the location of 13 crushed-stone (aggregate) operations across the Permian outcrop of Kansas. Although the stratigraphic unit being used was not indicated, it is safe to assume that some, if not all, of these operations were using Permian rocks. 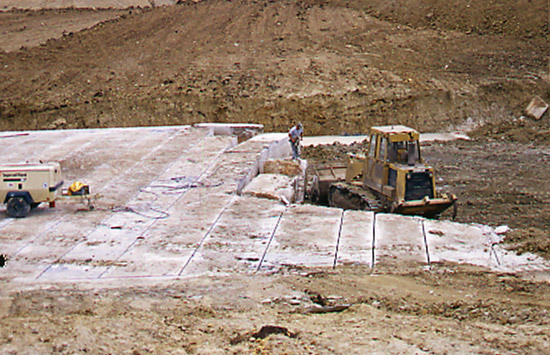 Aggregate is widely used in construction and road maintenance. Ground water is available to farms and small communities from limestone aquifers in the Council Grove, Chase, and Sumner Groups. Wells, streams, and springs receive water from these aquifers and wells may yield up to 100 gallons per minute and springs a much greater amount (Buchanan and Buddemeier, 1993). Sawin et al. (1999) provided information on 47 springs in the Flint Hills, including historic data for 13. Of these, 11 are springs and two are artesian wells. Water from one of the artesian wells is from the Barneston Limestone; the source of the water in the other is not known (Sawin et al., 1999, table 6). The source of the water in the 11 springs is the Wellington Formation, Winfield Limestone, Barneston Limestone, and Wreford Limestone. Water for most of the springs comes from the Barneston Limestone (Sawin et al., 1999, table 6). Also a number of unnamed springs supply water for domestic use, livestock, and farm ponds (Sawin et al., 1999, p. 27). A common stop along the Santa Fe Trail in the 19th century was Diamond Springs and others in Morris County, and even today a local spring is the source of the municipal water for Florence in Marion County (Buchanan and Buddemeier, 1993; Sawin et al., 1999).